Because this class was a service-learning course, it was required for students to obtain an internship and work a certain amount of hours each week. All of the internships would be affiliated with the United Nations and would work on disarmament campaigns in all different sectors. Dr. Bolton had a list of non-governmental organizations (NGOs) and we would choose our top three choices based on their work, description of their organization, and our own interest in what they do. I was lucky enough to get my first choice after Dr. Bolton put me in contact with an NGO, named Peace Boat. Before I knew it, I had a badge to enter the UN, had the opportunity to work with an international staff and learned what its like to be a part of the UN community. Some of the programs at Peace Boat combine learning, activism, advocacy, and travel, enabling participants to learn first-hand about global issues such as war, environmental degradation, and gender violence. If you’re wondering, YES there is an actual boat, and its global voyage docks here, once a year at the New York Harbor. Also important to mention, Peace Boat is associated with many other NGOs including as a member of the International Campaign to Abolish Nuclear Weapons (ICAN), the 2017 Nobel Peace Prize recipient. Pace University played a big role in this campaign with Dr. Bolton, Dr. Emily Welty and many students who worked on their advocacy. We have also hosted them here, at Pace for the Humanitarian Disarmament Forums. Number 1: Attending the United Nations General Assembly’s First Committee, which deals with disarmament and international security. One of my responsibilities was to work with our partners to discuss disarmament action plans and how to get the ball rolling. While attending the first committee my job was to take notes for our organization at Peace Boat and keep a tally of the countries that participated in the votes. It was also my job as an intern to network and spread the word about who we are and what we do at Peace Boat. The second highlight was when I witnessed a historical vote. On October 27th 2016, the First Committee adopted a landmark resolution – opening the negotiations of the Treaty on the prohibition of nuclear weapons. I got to witness history! Typically, the General Assembly meetings are very quiet and you can almost hear a pin drop, but when this resolution passed, everyone, mainly the NGOs sitting in the audience, went crazy! They were filled with joy and everyone clapped and celebrated! It was truly an amazing moment that I will never forget. The third and most memorable part of my internship was working with and interviewing the Hibakusha, the survivors of Hiroshima and Nagasaki. These men and women gave testimony in front of world leaders about their personal experience of how these weapons affected them and their own stories so the world could hear their pain. In one account, one man spoke about his fear to this day of doctor visits as they may find radiation poisoning in his system. He also spoke about living in fear of his children or grand children having birth defects and future generations being affected by radiation. Similar to when I have met holocaust survivors, these men and women are not only survivors of one of the most catastrophic events in world history, they’re living proof that all of us, all humankind, need to work together to achieve peace and never resort to violence. We cannot let history repeat itself. Through this class and internship I learned about a whole new world and much about myself. I work well with a team, under pressure, a fast paced environment, and I also learned you do not need to speak the same language to achieve the same goals. Even though our organization had members from all over the world, we all wanted the same thing – to help better this planet we all call home. Amazing things are happening every single day at the United Nations and I’m happy to I got to be a part of it. 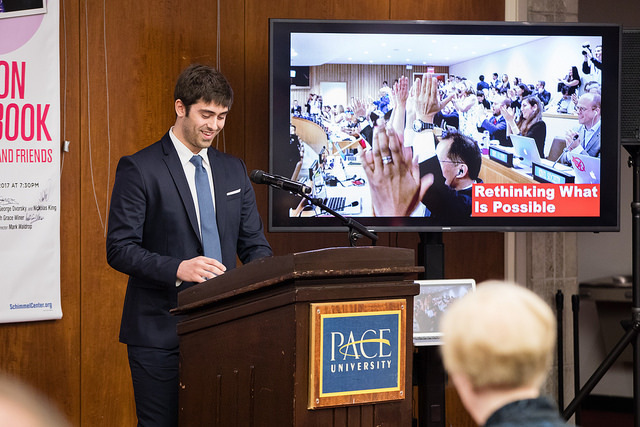 I’m also proud to say Pace University has been recognized by people of the UN for having an active role in promoting peace. 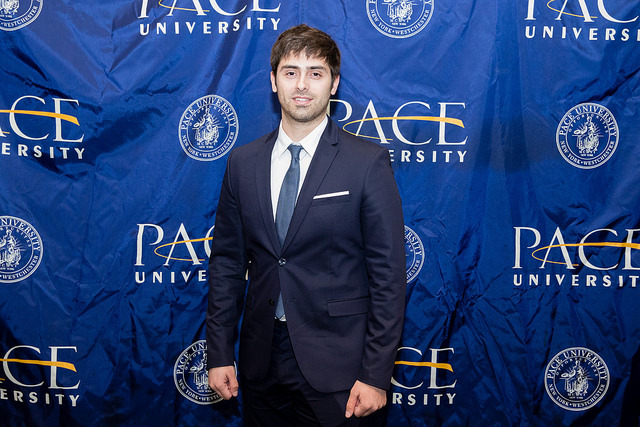 I would never have had this internship without Pace University, so I’m extremely thankful and look forward to future Pace students making a difference to better the world.